"I was looking forward to summer, but it's been a nightmare," said an exhausted mom I talked to recently. "The kids make messes around the house, play video games and fight all day. My 16-year-old is defying me at every turn and ignores me when I give her consequences. I'm at my boiling point every day-and getting tired of hearing myself scream at them. Can I get a do-over on summer?!" Letting your children know what is expected of them and holding them accountable actually puts them at ease (even though they will probably never admit it!) because they'll know what to expect from you. While we'd all like a do-over once in a while, you can do the next best thing take back control of your summer and take charge with your kids. You can actually take the first step right now by making up your mind that you want to do so. In the Total Transformation program, James Lehman talks about importance of "Realization"-recognizing and admitting that what you're doing isn't working right now and that you need to try something different. The next step is deciding what specific problems you want to focus on. On the Parental Support Line, we always recommend coming up with a plan for change and then working on just one or two key issues at a time before moving on to the next problem area. With a little work and planning-and a commitment to regaining your sanity-you can get your summer back. Here are 5 tips on how to get your authority back in your household as a parent and get your kids to listen and comply with requests-even if you didn't start the summer off on the right foot. Set limits: Establish some carefully-selected limits. When making changes, it?s always most effective to start with one or two target areas. Decide what one or two limits you want to start enforcing and communicate those to your child as clearly as possible. For example, you might say, "From now on, I want the video games off by 10pm," or "I want you out of bed by 9am and your chores done by noon." You don't have to get into a big, long discussion or debate, but you can offer a simple explanation and then disconnect from the conversation. After all, if you've made up your mind that you're not going to let your child negotiate, why keep that conversation going? Just stop and walk away. Enforce the limits: Come up with some logical consequences that you'll put into place if your child does not respect your limits. If the video game is still on at 11pm, then your child loses an hour of game time the next day, or you lock up the game the next day, and he can try again the day after. 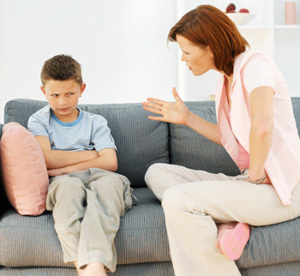 If your feuding children can't stop fighting over the computer, it's off limits for both of them for the rest of the day, or they can earn it back by going 2 hours without arguing. Consequences that are task-oriented (like the latter example) are far more effective when you want your child to practice a new behavior because it provides them with the motivation to do so. Create routine: Come up with a rough schedule that includes a time you'd like everyone to be up and some time for breakfast and getting dressed. You might also set aside a block of time for doing chores, for family activities, or for turning off the electronics, as well as winding down and getting to bed. It doesn't have to be overly regimented and strict, but at least write down some tasks or goals for the day in the order you'd like them to happen with some rough time frames. Meet defiant teens where they're at: Suppose you have the type of child who doesn't care about your limits, consequences, or routines at all-they come and go from your home as they please, you have no idea where they are or how they got there, and they do absolutely nothing around the house. Whether your child has simply started testing your limits or you feel you have lost your authority, then you will want to take a different approach to hold them accountable for following your rules. It's going to be helpful to look at what privileges your child really values-and that you have complete control over-and focus on those, as Kimberly Abraham and Marney Studaker Cordner advise in their program for ODD kids. If you can't control the video game access 100%, then don't use it as a consequence-it won't work. Kids who take off whenever they want to and ignore everything you say are going to try to find every way possible around your limits and consequences, so focusing on what you can control is important, whether it be the car, their cell phone, giving them money for things, or canceling the cable or internet (yes, you may have to make some sacrifices if you can't find anything else you have control over). The point is, find something you have control over and be prepared to follow through. Defiant kids need to know that you "say what you mean and mean what you say," as James Lehman so aptly put it. Also, when choosing areas to focus on with more defiant kids, it might be wise to start with behaviors that pose the biggest safety threat first and "coach them forward" from there. Problem-solving is an incredibly important tool to utilize with this defiant teens. It will be important to talk with your child about the reason for sneaking out or not listening-what are they thinking when they do that? Kids often use faulty thinking to justify defiant behavior (like thinking that your rules are unfair or you treat them like a baby), so find out what thoughts are at the root and point out that they don't justify their behavior. You can say, "It sounds like you're blaming me for the fact that you didn't do your chores today. You're responsible to do your own tasks or there will be consequences." Talk with them about what they can do going forward to deal with their anger or frustration with your rules, like listening to music while they do their chores, so they can cope better and meet your expectations. That brings me to another note: appeal to your child's self-interest. What's in it for them to follow your rules? How will it make their lives better or easier? You might say something like, "What can you do to stay home when you don't have permission to be out, and therefore keep from losing your _______ privilege?" Be proactive: Younger kids especially will need your help planning social activities and finding entertainment that offers enrichment. You can also sit down with your child and come up with a list of things he or she might like to do before the end of the summer that works for your family's schedule and budget. (This could include simple activities, like having a favorite friend for a sleep over, going to a museum on a hot day, or visiting a favorite community pool or beach. Also, in the Total Focus program for kids with ADHD, Dr. Robert Myers suggests making an "I'm bored" collage that includes visual cues of all the things your child can do at home on their own if they are bored. You can direct them to look at this in those moments when they come to you whining about having nothing to do. Being out and about all day every day just isn't likely, and so this will help for those times at home in between outings. And, while it's your job to provide some options, remember that it's not your job to entertain your child every second of every day. If you're a working parent, first let me say that summer can be very tough, especially if you have adolescents at home during the day. It's difficult to get your children involved with home or family projects or to structure their time in any way when you're not there. It's not uncommon for parents to get countless phone calls or texts during the work day from their feuding children who just can't seem to get along for five seconds. You begin to dread coming home after work only to hear each of your kids rant and complain about what the other one did or said. In cases like this, it's vital to hold both children accountable. As the old saying goes, "it takes two to tango." Talk with your children about your expectations and what they can do to stay busy, as well as how to cope if their sibling starts to push their buttons. What can they do to avoid or get out of an argument? Where can they go if they need a break? Once you've clarified your expectations and provided your children with some skills to solve their problems, it's important that you hold them both accountable as well. Time and task-oriented consequences work very well here. If your kids aren't able to avoid conflicts with each other, perhaps they lose a privilege until they can go a day without fighting. If you try this and it doesn't seem to help, then it might be the case that staying home without a parent is something at least one of your children isn't ready for. If you decide this is the case, then you might want to seek out some supports in your community, whether it's a day camp program at a rec center or local church, or another parent or relative. What will we see if this isn't working? What will we do if it doesn't? Letting your children know what is expected of them and holding them accountable actually puts them at ease (even though they will probably never admit it!) because they'll know what to expect from you. Showing them that you'll follow through will also help them learn to respect your boundaries over time. When you include structured recreation in your routine, whether it's community events, family projects, or volunteering, you will not only add more fun to your summer, but offer your child opportunities to learn and grow as well.